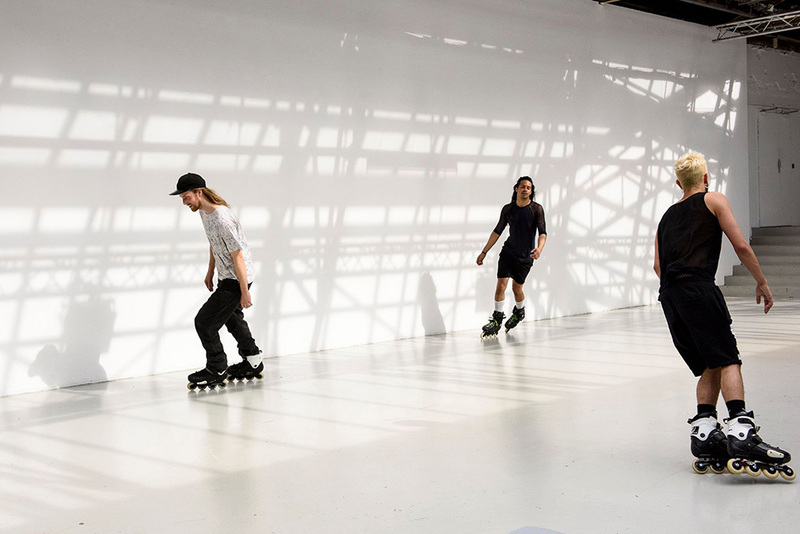 Us Swerve is a choreographic score for performers on rollerblades who orbit one another whilst reciting, remixing and reformulating fragmented lines of poetry that meditate on desire. This contingent, polyphonic script circulates among the performers and is perpetually altered by their movements, attitudes and affects. Through their continued speech, the performers begin to channel a queer archive of verses and inflections, including lines from Essex Hemphill, Eileen Myles, Langston Hughes. The rollerbladers both move through, and are set in motion by, these articulations of desire and the sensuality of repetition. Alex Baczynski-Jenkins works with choreography and performance. Previous solo exhibitions include: Foksal Gallery Foundation, Warsaw(2018) and Chisenhale Gallery, London (2017). He has also presented work at: Migros Museum of Contemporary Art, Zurich (2018); Palais de Tokyo, Paris; Museum of Modern Art, Warsaw (both 2017); Swiss Institute Contemporary Art, New York; MuzeumSztuki, Łódź (both 2016); and Basel Liste (2014). He is co-founder of feminist and queer project space Kem in Warsaw. Kem have recently realised projects at the Museum of Modern Art, Warsaw (Kem Care, 2017) and are currently on a one year residency at the Ujazdowski Castle Centre for Contemporary Art (Three Springs, 2018-2019). He was a fellow at the Home Workspace Program, Beirut between 2012-2013. He is recipient of the Arts Foundation Award and Frieze Artist Award (both 2018).